I plant the seedlings in the Spring, and then I spend the next few months fussing over them, waiting for the moment when I can sink my teeth into the first ripe tomato of the season. After what felt like a lifetime of waiting, my tomatoes finally started turning red last week. As soon as I got the first juicy red tomato off the plant, I made the ultimate summer sandwich: A tomato sandwich. I realize that some of you will recoil in horror when you read what I put on my tomato sandwich, but I’m OK with that because it tastes so good. 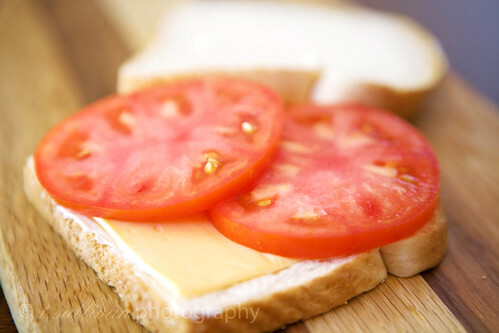 There are probably as many ways of making a tomato sandwich as there are stars in the sky, but in my opinion, there’s only one right way to make a tomato sandwich. There are four parts, and only four parts. First, white sandwich bread. Sure, you could use other bread, but it wouldn’t be right. Next, mayonnaise. Not light mayo, not mustard, and certainly not that abomination they call Miracle Whip. Only the real stuff will do here. Third, and perhaps the most offensive of the ingredients, one Kraft Singles slice. Yes, I do mean the stuff labeled “processed cheese product”. I love a good cheese as much as the next person, and I’ve tried other cheese in my tomato sandwiches, but the Kraft Singles can’t be beat. Honest. Last, and most important, a fresh from the garden tomato, sliced thick. If you don’t grow your own, or know a neighbor / coworker with so many tomatoes growing that they’re practically willing to pay you to take them, a farmer’s market tomato would be an appropriate substitute. Don’t even bother attempting this with a store bought tomato. It will only lead to disappointment and tears, and maybe even ruin your life. Don’t say I didn’t warn you. That’s it! Put those four ingredient together and sink your teeth into the best tomato sandwich I’ve ever had. What’s that? You think there’s some other right way to make a tomato sandwich? Let me hear it! I’ve got a lot of tomatoes to eat before the season ends. I make mine the same way, except I add a little fresh ground pepper to the tomato for an added kick. Mmmm Good. Unfortunately all my tomato plants were taken by that stupid tomato/potato disease. Pissed me off something bad since I was growing 5 types and really looking forward to eating them fresh. So if i put tomoto on my grill cheese, isn’t that really the same thing? Just found your blog and I love it. Fresh summer tomatoes are the best. I love an easy tomato sandwich! What a gorgeous blog! Love your photography. Same way I do it….except I add a sprinkle of salt and I must grill the sandwich with a little butter. Also, my husband loves butter biscuits with “home grown” tomato and a little salt. Mmm..Mmm Good! I grew up eating them that way, except they were open-faced with toasted bread. Not crunchy-toasted, but just barely toasted. It makes the cheese a tad melty, which is wonderful. Nowadays I eat mine with whole wheat bread and whatever cheese I have around (often cheddar). And I sprinkle dried basil onto the mayonnaise. But whatever the variation, I agree that this is one of the best ways to appreciate a garden tomato. I lived off of these in college! Glad to know I’m not the only one who likes them.